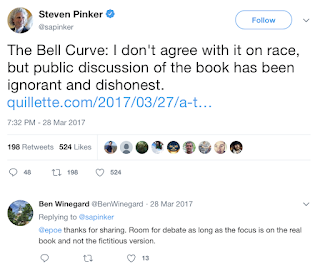 PINKERITE: I Have a Nightmare: Steven Pinker, Quillette and the "biological reality of race"
I Have a Nightmare: Steven Pinker, Quillette and the "biological reality of race"
"A Tale of Two Bell Curves"
When Sam Harris and Ezra Klein clashed over Harris's support for Charles Murray, Harris posted their exchange on his blog. At the time Murray wrote The Bell Curve, these claims were not scientifically controversial—though taken together, they proved devastating to his reputation among nonscientists. In fact The Bell Curve was scientifically controversial from the beginning. It should also be noted that Charles Murray isn't a life scientist but a political scientist. His co-author Richard Herrnstein was a psychologist who died in 1994. The Bell Curve was known for getting some of its studies from people supported by the white supremacist Pioneer Fund. Harris defends his take on The Bell Cuve by linking to an article in Quillette by brothers Ben Winegard and Bo Winegard called "A Tale of Two Bell Curves." Have African Americans in general been poor since the days of slavery? Yes. So there you have it - black people have been poorer than whites since the days of slavery and not only does the legacy of slavery impact the acquisition of wealth by blacks, an important related issue is unequal education attainment. Poor education leading to poverty and the stresses of poverty itself combine to provide a compelling case that blacks having lower test scores than whites is not genetic. I wasn't aware of either of the two studies until I made a tiny effort to look. Did the Winegard brothers bother to look for such studies? The Winegards and Boutwell not only don't know which races exist in any biologically-justifiable way, they feel this is the non-platonic-essence ideal: race classification should be like film categories - your friend might use one proprietary system, Netflix might use another and "one might" start with five sweeping categories and then choose "granular" categories which, if you are in the mood, you can call "race." 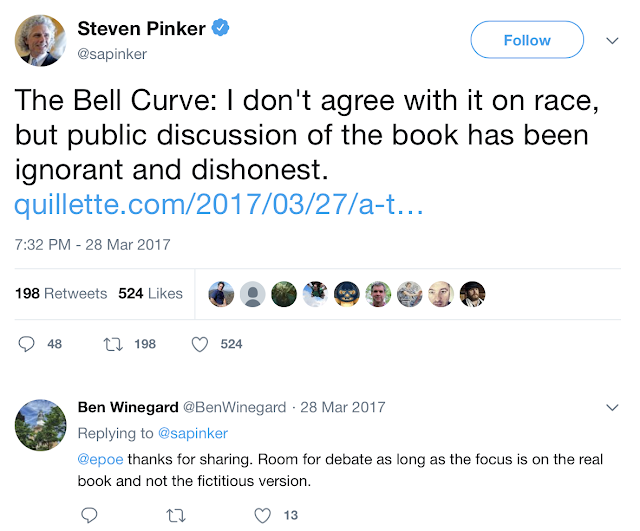 Steven Pinker liked the Winegard/Boutwell article so much he linked to it from his Twitter account. White supremacist American Renaissance liked it too, and reprinted it. Pinker can be heard in this video saying that to deny the biological reality of race is to deny reality itself. Meanwhile he supports an article that goes one step beyond claiming race is a social phenomenon and instead claims race is a personal phenomenon, a group of classifications each individual can create for themselves based on convenience and expediency, subjective and completely unconcerned about issues of empiricism or even shared benchmarks with fellow race science proponents. Race science proponents believe in the reality of race enough to classify "black" people as less intelligent than "white" people, while allowing the classification of race itself to be determined by personal taste. How is that not a recipe for bigots skewing studies of race and intelligence any way they wish? Quillette is always howling about "postmodernism" just as Steven Pinker does, but how is this choose-your-own-race-categories based on whim any different from the most dastardly postmodernist's refusal to accept objective definitions? Bo Winegard is currently Assistant Professor of Psychology at Marietta College in Ohio. Ben Winegard is currently Assistant Professor of Psychology at Hillsdale College in Michigan. Brian Boutwell is currently Associate Dean for Research and Corporate Partnerships College for Public Health and Social Justice and Associate Professor of Criminology and Criminal Justice at Saint Louis University. Beaver is currently the Judith Rich Harris Professor of Criminology and Director, Distance Learning Program at Florida State University. The recent popularity of consumer DNA testing has shown that very often individuals have no idea what their genetic ancestry is, making self-identification useless and making claims of race attributes based on such tests absurd, at best. Brian Boutwell has also appeared on white supremacist Stefan Molyneux's Youtube channel promoting race science. Most people believe that race exists. They believe that Denzel Washington is an African American, that George Clooney is a Caucasian, and that George Takei is an Asian. * Many intellectuals, however, contend that this belief results from an illusion as dangerous as it is compelling. In their intellectuals-v-the-people construct they echo Steven Pinker, noted by Louis Menand in his review of "The Blank Slate"
Intellectuals deny biology, according to Pinker, because it interferes with their pet theories of mind and behavior. These are the Blank Slate (the belief that the mind is wholly shaped by the environment), the Noble Savage (the notion that people are born good but are corrupted by society), and the Ghost in the Machine (the idea that there is a nonbiological agent in our heads with the power to change our nature at will). 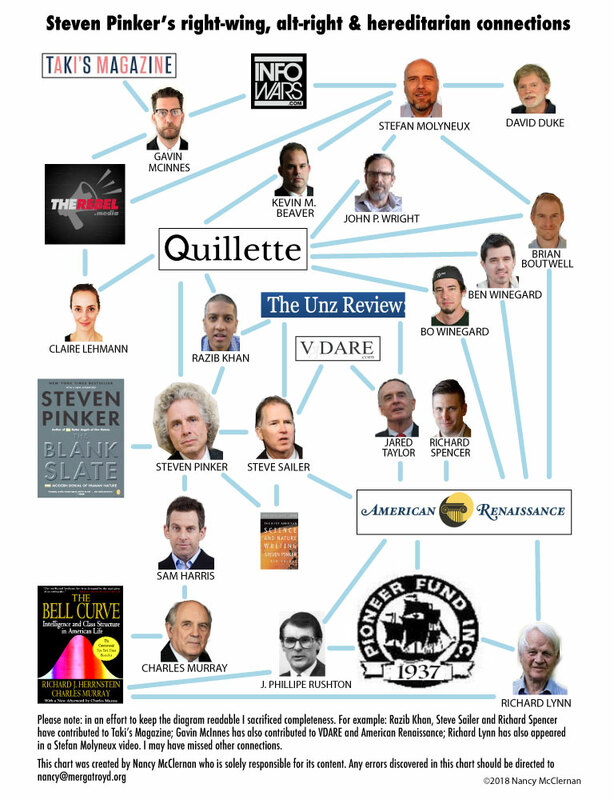 The "intellectuals" in Pinker's book are social scientists, progressive educators, radical feminists, academic Marxists, liberal columnists, avant-garde arts types, government planners, and postmodernist relativists. The good guys are the cognitive scientists and ordinary folks, whose common sense, except when it has been damaged by listening to intellectuals, generally correlates with what cognitive science has discovered. I wish I could say that Pinker's view of the world of ideas is more nuanced than this. If you expect something more convincing to support the claim that race is a biological reality than windy assertions and postmodernist classification schemes you will be someone who holds, per Harris, a "highly moralistic/tribal posture. Is it a mere coincidence that Pinker minimizes injustice against African Americans? Well consider this from the Menand review of "The Blank Slate"
And this from the Elizabeth Kolbert New Yorker review of Pinker's "The Better Angels"
Pinker was not pleased with the Kolbert review and asked Razib Khan, a leading proponent of race science, to defend his work. Pinker seems determined to deny the role that economics plays in the condition of post-Emancipation African-Americans. Just as the Winegards, in the Bell Curve article cited by Sam Harris claim that a legacy of slavery is insignificant. It appears to me that race science proponents are attempting to make the case that genetics explain why African-Americans have failed to thrive in the United States, post-Emancipation by ignoring, minimizing or denying the role that economic conditions and injustice over time have played - and still play - in their lives. And because the entire history of African-Americans right up to the present is full of grotesque injustice, the race science proponents are attempting to portray those who insist historical facts and current events are important as emotion-driven moralists. Brian Boutwell is either unaware of the irony, or perhaps is just that shameless, in hijacking the words of Martin Luther King, Jr.'s "I Have a Dream" speech to argue against "pleasant myths" and for "inconvenient truths" about the black "race" and its alleged lower intelligence and higher criminality. In the absence of any empirical standards, how will "race" be determined? All that remains of the claims of the "biological reality" of race is a social construct, the average person's gut instinct of "race." If one knows that Thomas is a Caucasian, one can be reasonably sure that Thomas has relatively light skin, and that he has recent ancestry in Europe.